In response to Chinese panel makers’ latest moves to start producing large liquid crystal display panels, market analysts called on Korean display companies to speed up execution of their plans to switch existing LCD panel production lines to organic light-emitting diode panel lines at a conference held in Seoul on Tuesday. “In the long run, it is clear that LCD prices are going downhill -- with some quarterly ups and downs -- but Samsung Display and LG Display are still being cautious about shutting down their LCD fabrication lines or switching them to OLED,” said Alex J. Kang, principal analyst at IHS Markit at Korea Display Spring Conference 2019. “We hope to see the Korean companies speed up their shift to OLED in order to ensure greater profitability in the premium market as early as possible,” he said. While Samsung Display has enough room for shifting the current large LCD production capabilities to large OLED, LG Display is having more difficulty in converting its current LCD fabrications to OLED, due to its overreliance on LCD business. “According to our analysis, LG Display’s LCD business accounted for over 80 percent of its total sales last year, and this why the company cannot give up on LCD,” Kang said. Samsung, heavily reliant on small and medium-size AMOLED display panel business that takes up around 80 percent of its total sales, is more likely to speed up conversion of some of its LCD fabs to quantum-dot OLED. “Samsung is considering converting some of its 8.5th generation fabs to QD-OLED, and if the plan is executed, we expect QD-OLED panels to be commercialized as early as by the end of 2020 and the beginning of 2021,” the analyst said. The initial volume of QD-OLED panels is estimated to be 300,000 units, according to the researcher’s forecast. In standing against LG’s OLED technology, Samsung is planning to develop self-emissive panels using quantum dots, widely called QD-OLED. It is also categorized as a segment of OLED technology. Amid expected ramping up in the capacities of large-size LCD fabs -- Gen. 8 and Gen. 10.5 -- by China’s BOE, LG Display is facing growing pressures in terms of price competition. Chinese companies are forecast to overtake the leadership of the large-size LCD panel market this year with an estimated 40.6 percent share. Korean firms’ market share is estimated to be 33.8 percent, according to IHS Markit. 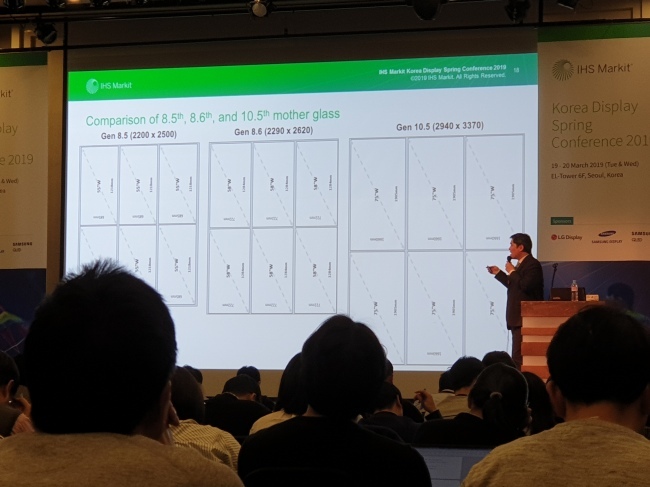 “Korean panel makers will seek expansion into the premium market, including commercializing 8K panels, high-end PC monitors and IT displays with premium features in order to secure profitability,” said Chung Yoon-sung, senior director at the market researcher.